LAS VEGAS, April 8, 2019 /PRNewswire/ -- SmartSens, a global supplier of high-performance CMOS image sensors, today announced DSI pixel, as SmartSens' latest enhanced SmartPixel™ technology, at ISC West 2019. DSI pixel is the next-generation sensor technology provided by SmartSens that gives customers better image performance, faster time to market and higher cost effectiveness, compared to previous technologies. Additionally, the DSI pixel technology innovatively integrates SmartSens' design and pixel process knowledge into the foundry service by DB HiTek. 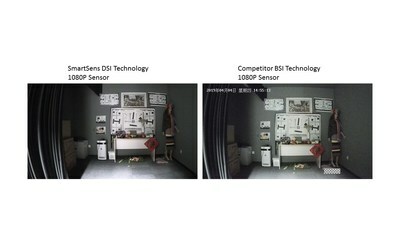 The DSI pixel technology has surpassed both FSI and BSI in terms of performance. Equipped with SmartSens' advanced sensor design architecture, the DSI pixel has significantly improved image performance across metrics. While compared to the current SmartPixel™ FSI performance, the DSI pixel excels in sensitivity improvement and dark current reduction by 2x and 5x respectively. 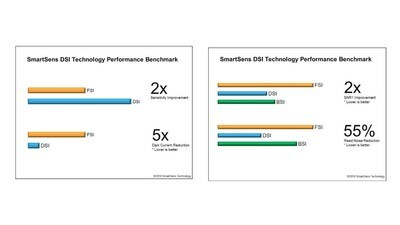 When compared to a different vendor's BSI sensor performance, SmartSens' DSI technology offers enhanced SNR1 and read noise performance. SmartSens will demonstrate its highly selected line of innovative products designed for security and surveillance at meeting room Casanova 605 in the Sands Expo Center from April 10 to 11 during ISC West 2019. For more information about the products, please contact the SmartSens sales and technology department: cs@smartsenstech.com. SmartSens Technology is a leading supplier of high-performance CMOS imaging systems worldwide. Our global teams are developing and shipping game-changing and market-leading products. Coupled with strong support from strategic partners and ISO-certified supply chain infrastructure, we have delivered innovative, customer-focused, award-winning and high-quality imaging solutions for security and surveillance, consumer, AR/VR, IoT, automotive, industrial automation and other mass-market applications. To date, chip shipments have exceeded 100 million units. For more information, please visit www.smartsenstech.com. DB HiTek Co., Ltd. specializes in superb analog and power processing technologies. The company adds high value to advanced ICs with a processing portfolio that encompasses BCDMOS, RF, Mixed-Signal, High Voltage CMOS, CMOS Image Sensor, Embedded Flash, MEMS and SJ MOSFET technologies. With its best-in-class BCDMOS technology, the company manufactures power management chips that serve numerous applications ranging from consumer and communication electronics to automotive and industrial systems. Currently processing technologies at nodes ranging from 0.35 microns to 90 nanometers, the company complements its world class foundry capabilities with top quality design support including IP and design libraries, as well as process design kits and prototype verification. Headquartered in South Korea, DB HiTek publicly trades its stock under 000990 on the Korea Stock Exchange. DB HiTek was formerly known as Dongbu HiTek Co., Ltd. For more information, visit www.dbhitek.com.